As financial crime spirals upward and online and mobile transactions become commonplace, regulatory agencies and banks alike are struggling to get ahead of increasingly sophisticated money laundering efforts, including offshore tax havens, Ponzi schemes, sanctions violations, and collusion. 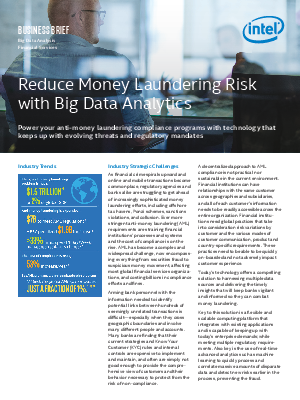 Ever more stringent anti-money laundering (AML) requirements are straining financial institutions’ processes and systems and the cost of compliance is on the rise. AML has become a complex and widespread challenge, now encompassing everything from securities fraud to suspicious money movement, affecting most global financial services organizations, and costing billions in compliance efforts and fines.